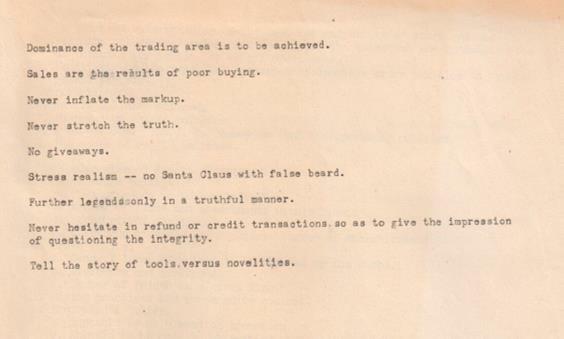 I found this old typed memo from my grandfather who founded Toy House in 1949 while sorting through the archives. It was stapled to the top of some mimeographed sheets (remember the mimeograph and it's purple ink?) of a business plan outline. I think this alone could be the blueprint of a business plan for many retailers. Dominance of the trading area is to be achieved. Sales are the results of poor buying. Stress realism -- no Santa Claus with a false beard. Further legends only in a truthful manner. Never hesitate in refund or credit transactions so as to give the impression of questioning the integrity. Tell the story of tools versus novelties. Although I disagree with the giveaways, there is a lot of sage wisdom in the remaining statements. I especially like the second to last one. If you want to create a positive lasting impression, don't question the integrity of your customers. Sure, there will be one or two that try to screw you. But in the end, those will be far and away offset by all the customers delighted by your treatment of them. PS I also love how he started with Dominance of the trading area. Never shy about his goals, my grandfather always said "Plan for success." What is your plan for success? Great list. I actually agree with his sentiment about giveaways I think. If there is no 'stretched markup' the there is no fat to giveaway. I suppose he was saying there is no free lunch. Would love to know what he meant by the last one though? Dennis, that last one was dealing with how toys have been and are sold today. Many toys are simply novelties designed to entertain. They have very little play value and although they have great "shelf appeal", they really are not toys. True toys interact with kids and get the kids to use their imagination. Those toys are tools that help children develop and grow. Those toys have more play value, last longer, and are better investments. He (and I) have been teaching that to customers for years.